Iodine solution helps to tackle whole body iodine deficiency that can contribute to chronic ill health across a wide range of conditions. Every cell in the body needs iodine to function correctly. Without enough iodine, our bodies are left open to auto-immune disorders, arteriosclerosis, thyroid malfunctions and cancers. Toxic substances found in our food and water supplies flush our body of the precious iodine it stores naturally. It is important to understand that most of us have what is termed sub-clinical hypothyroidism even if we are not clinically diagnosed with an over-active or under-active thyroid. Sub-clinical hypothyroidism can leave us feeling tired and suffering lack of mental clarity. Iodine is the main agent in therapy for over and under-active thyroid conditions. Essential for all hormone production. If you have low thyroid action and are taking thyroid medications, the use of Iodine will almost invariably increase your metabolic rate, necessitating, in most cases, a reduction of your thyroid medications such as thyroxin. Iodine sufficiency is very important for pregnancy. See the further reading tab for more information. Minimum maintenance use 12mg (3 drops) daily. This is the daily amount of Iodine in the average Japanese diet. 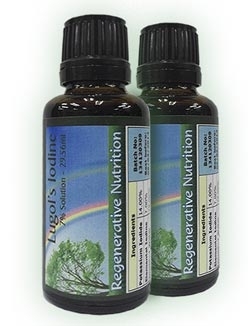 We would typically suggest between 12-50mg iodine solution daily (3 to 12 drops). Some people may require up to 100 mg daily (25 drops) for optimum effect. We suggest this as the upper level dose. Experiment with dose to find the right level for you. For best results: Take at least 1 hour apart from anti-oxidant supplements including vitamin C. Can be taken at any time except on a full stomach, e.g. any time before meals or on rising or retiring. For a relaxing effect take with fruit or vegetable juice. Otherwise take with water. Amounts suggested are as per adult instructions but relative to body weight. Example: a child weighing four stone (25kg) is 1/3 the weight of a typical adult weighing 12 stone (76kg) so divide the adult dose by 3, i.e. maintenance use 1 drop daily. A baby weighing 7 kilos relates to 1/10th the adult use i.e. one third of a drop daily, to accomplish this give one drop in feed every 3 days. For infections follow the same calculations as for adults e.g. 30 drops a day for adult relates to 3 drops a day for an 8kg baby. Note: For detailed information about the safety and history of use of Iodine supplementation click here. People who consume approximately 12mg of iodine daily are found to be in remarkably better health than those who don’t. They also have a reduced occurrence of diseases such as endocrine related cancers e.g. breast, ovarian and prostate, and also all other cancers. These are the findings of dedicated physicians such as Dr David Bownstein and Dr Guy Abraham from their many years of clinical experience and several decades of worldwide study. The "powers that be" have lied about iodine as it's a major tool for improving health and hence reducing the profits and power of Big Pharma (see the further reading section at the end of this article for links to the article: Safe Levels of Iodine Supplementation and Medical Misrepresentation - Additional Information). A considerable part of the reason for chronic ill health across a whole range of conditions can be attributed to whole body iodine deficiency. Every cell in the body needs iodine to function correctly, but just the ramifications of proper thyroid function alone is considerable on an individual’s health. The introduction of toxic chemicals to our water and food especially the halogens, chlorine and fluorine in water and bromine added to bread cause the body to flush out what little iodine was already there leaving chronically low levels of iodine and blocking iodine uptake, leaving whole populations open to auto-immune disorders, arteriolosclerosis, thyroid malfunctions and cancers amongst other serious health conditions. It is important to understand that most of us have what is termed sub-clinical hypothyroidism even if we are not clinically diagnosed with gross thyroid under or over-functioning. Sub-clinical hypothyroidism reduces the energy and creative thinking ability of many of us, and leaves us open to diminished bodily functions and eventually disease and infection. Dr Barnes has done good work in this area in establishing a simple home temperature test that will indicate how our thyroids are actually functioning. Hospital tests of thyroid hormone levels are not always accurate and do not reveal the whole picture. Please refer to our conditions list for specific, further information on health conditions. Iodine plays a very important role in the elimination of many health conditions, alongside other nutritional remedies. Iodine works on improving not just thyroid function but is beneficial (essential) for the entire hormonal system and the knock on benefits are wide indeed. Iodine affects every cell in the body and is essential for nerves/brain cells to function properly. In conjunction with Selenium, it helps to remove mercury and other toxins from the system. Iodine is also important for the production of sufficient stomach acid and hence affects the digestive system. Low metabolic rate, one of the prime indicators of Iodine deficiency leads to general under functioning of many body systems and a state of internal sluggishness. This can cause multiple problems slowly developing over years. One example is excess mucous retention and this can, for example, be a contributory factor in asthma and bronchitis. There are so many organs, glands and systems iodine facilitates, and so many biochemical processes it performs. To download a short information sheet about the suggested levels of iodine use, and how to experiment with your own best does, please right click on the icon below and select "save target as...." or simply click the icon to view in your browser. Iodine supplementation is essential if we want optimum health. It is such a safe mineral compared to commonly used trace element supplements such as zinc and certainly selenium. Even if you feel perfectly well, just 12 mg a day of iodine can help fight off infections so that the "latest" pandemic scare need not concern us if we understand Iodine's use in eliminating infections. Unless of course you are drinking and even bathing in chlorinated water and eating quite a lot of bread with bromine added, then you will need more than 12 mg daily for whole body sufficiency. In fact many people have high levels of bromine in their system that can be flushed out over a period of weeks using Iodine in the higher dose range referred to in this article (and/or it's links). The uses of iodine and the health benefits gained are many and very wide ranging, wider than is generally realised by people who have made a moderate study of Iodine. This is because there are so many areas of action. For example, just in the area of wiping out infection, including the chronic infections that are almost always present in all serious disease such as all auto-immune disorders, and even cancers. Cancer has been found to thrive in conditions of fungal overgrowth. Then there is the modern plague of Candida infection, dysbiosis and also the related chronic fatigue, these can all be dealt with and of course prevented with Iodine supplementation. The use of Lugol's solution may be the most elegant way to treat Candida and other infections. See the article here for a more thorough discussion of the subject, and other options. The use of Zell Immunocomplex and Sodium Ascorbate Vitamin C are also suggested whilst clearing infections and beyond to help the body detox. Zell Immunocomplex is also a good complement to iodine supplementation as it provides selenium, B vitamins and respiratory (mitochondrial) enzymes that are all complementary to Iodine, to help restore the metabolism, and organify iodine so it can be used to normalise thyroid and metabolism. Some people with thyroid problems will not respond to iodine alone, as they need such complementary nutrients. Unrefined salt such as Celtic Ocean Sea Salt and magnesium supplements such as Mag Sea Pure are also foundation supplements to help normalise thyroid and the general health and well-being. Dr David Brownstein and Dr Guy Abraham discovered that in some cases the iodine transport mechanism does not work properly. This can be rectified with 3g daily of Sodium Ascorbate Vitamin C. Poor Utilisation of iodine occurs in people with high blood levels of bromine also. In these cases, iodine in the range of 50 to 75mg daily has been found to work. We have always advised taking Lugol's Iodine apart from antioxidants by at least an hour. Lugol's Iodine is a mixture of Potassium Iodide (KI) and elemental Iodine (I). The reasoning behind keeping Lugol's and antioxidants apart is that when Lugol's is mixed with an antioxidant such as vitamin C (in orange juice for example), or mixed in the stomach with the same, then some or all of the iodine will be converted to iodide. Lugol got it right when he formulated his famous mixture as the body needs both forms, Iodine and Iodide; he also had the correct ratio between the two. Therefore converting more to iodide will invariably reduce some of the benefits of Lugol's supplementation. So, we continue to advise taking Lugol's at least an hour apart from vitamin C or other potent anti-oxidants. Small amounts of vitamin C (such as contained in a very small glass of grape juice) will have a limited detrimental effect (but still some effect) but is still advised for those who find the taste unpalatable, however if this is not an issue then it is wisest to simply mix it with water. No! Whilst mixing with antioxidants will be detrimental to the efficacy of the Lugol's Solution, it is not detrimental to ones health. So for those who have used Lugol's solution alongside anti-oxidants; no harm would have been done, the Lugol's would just have been rendered less beneficial. Use of Iodine as part of a wholistic healing regime has extremely wide ranging benefits, see the Core Regime article here for more details. To download the book Iodine Remedies: Secrets From The Sea, by Dr. Chris Robin, in .pdf format, right click on the icon below and select "save target as..." or to view in your browser, simply click on the icon. To download the article Iodine - The Universal & Holistic Super Mineral By Dr. Gabriel Cousens, MD, MD(H), DD, in .pdf format, right click on the icon below and select "save target as..." or to view in your browser, simply click on the icon. Nina, aged 37, from Peterborough in the UK has an underactive thyroid, Candida and ovarian cysts. She has used a combination of supplements and remedies until she found what works best for her. Namely, Iodine (Lugol's solution), Seagreens, Wild Yam and Colloidal Silver. Nina say's "I've been taking Iodine as my main remedy as I have suffered from underactive thyroid for over 3 years. I used to take Levothyroxine for a long time but as doctors couldn't find the right dose I decided to do a research on natural remedies that would help improve my condition and had found that when I started taking Lugol's Iodine solution my blood tests were 'perfect' and even my cholesterol level came down to 'normal'. I also gradually stopped taking Levothyroxine and eventually ditched it. Iodine, along with Wild Yam and Colloidal Silver, helped me get rid of my ovarian cysts and Candida too. So, I'd like to say a great THANK YOU to Regenerative Nutrition who have proved very reliable and helpful, and will hopefully provide us with natural remedies for years to come..."